Mike "The Situation" Sorrentino is looking at time behind bars for tax evasion. Pat Battle reports. 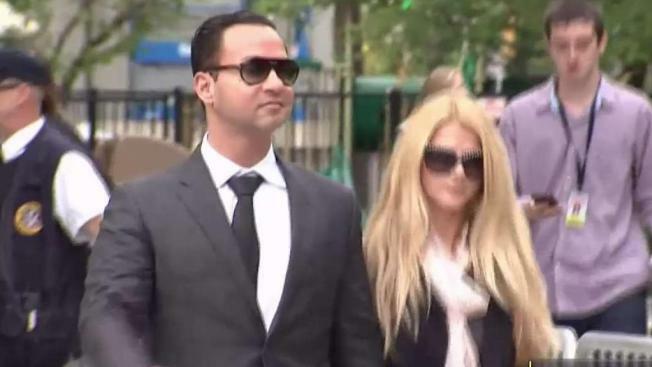 Michael "The Situation" Sorrentino, whose abs became famous on the hit reality show "Jersey Shore," was sentenced Friday to eight months in prison for cheating on his taxes. A federal judge sentenced the star shortly after his brother, Marc Sorrentino, received a two-year sentence on a similar charge. Both brothers pleaded guilty in January. They were charged in 2014 with tax offenses related to nearly $9 million in income. Michael Sorrentino's attorneys had sought probation, while prosecutors wanted a sentence of 14 months. He is free on bail until he has to report; it's not been determined where he'll be incarcerated or when the term begins. The Situation declined to comment while leaving the courthouse with his fiancée, whom he is scheduled to marry next month, his attorney said. Other "Jersey Shore" cast members who attended the sentencing also didn't comment afterward. In a statement to the judge before sentencing, Sorrentino apologized for his conduct and said he is "overcoming my demons and putting my life back together" after years of alcohol and drug use. "Today I'm a man that I should have been years ago," he told U.S. District Judge Susan Wigenton. Attorney Henry Klingeman portrayed Sorrentino as the son of an abusive father who suffered from substance use problems and low self-esteem before he "rocketed to celebrity and riches" on the MTV reality show that followed a group of boozing, rowdy housemates at the New Jersey shore. Prosecutors painted a contrasting picture. While conceding The Situation may have played a lesser role in the tax scheme than his brother or accountant Gregg Mark - who also has pleaded guilty and awaits sentencing - they noted he had the presence of mind to split up bank deposits into amounts lower than $10,000 so as not to trigger federal reporting requirements. "This was a deliberate course of criminal conduct with a blatant disregard for the law," Assistant U.S. Attorney Yael Epstein told the court. Michael Sorrentino pleaded guilty to one count of tax evasion and admitted concealing his income in 2011 by making cash deposits in amounts that wouldn't trigger federal reporting requirements. Marc Sorrentino pleaded guilty to one count of assisting in the preparation of a false return. In pronouncing sentence, Wigenton commended Michael Sorrentino for his progress in overcoming substance abuse but stressed that his actions in the conspiracy were made knowingly. "With celebrity comes responsibility," she told him. "Part of the cost of making money is you have to pay taxes. We all have to." John Tafur, head of IRS criminal investigations in Newark, called the brothers' crimes "an outright theft from the hardworking American public." The Situation appeared on all six seasons of the reality show that ran from 2009 to 2012. The cast members were known for their drunken antics and the phrase they used to describe their lifestyle: "gym, tan, laundry." Republican former Gov. Chris Christie criticized the show for promoting stereotypes. Last year, he signed a bill capping the amount of state money universities can pay for speakers, because Rutgers University paid "Jersey Shore" cast member Nicole "Snooki" Polizzi $32,000 in 2011.